I have gotten a lot of emails and comments from several of you who were having a little bit of difficulty making their tissue paper rosettes. The word “twist” was a bit confusing and it is hard for me to explain how I was twisting mine. So I went ahead and made quick video tutorial for Tissue Paper Rosettes. Now I must warn you…this is not a high quality production. I simply propped up my cell phone between some cracker boxes and had my son push record and stop when I gave him a cue. He he! But hopefully you will be able to see how I am twisting the paper. I tried to get in as close as possible so you could see the tissue rosette in as much detail as possible. Hope this helps you. These are the perfect decoration for Valentine’s Day and they are really inexpensive to make. They just take time. I would suggest making these when you sit down to relax and watch television or a movie! It’s Valentine’s Week! Every day this week we are sharing some great ideas for Valentine’s Day. We kicked off the fun filled week yesterday with the Pink Lemonade Pie! And a GREAT giveaway from The Paper Cupcake Etsy Shop! 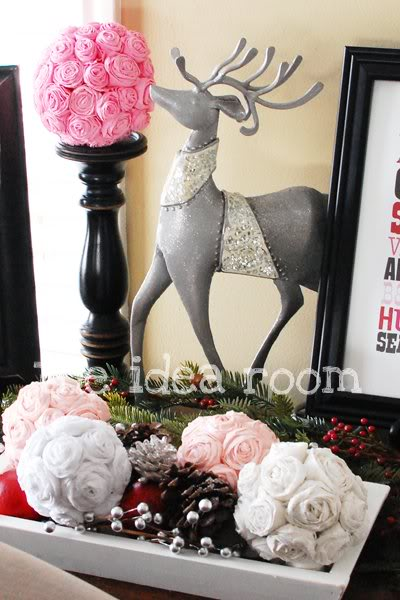 Today, Gina at The Shabby Creek Cottage helps you decorate for the holiday. She will also have a giveaway, you won’t want to miss it!! Be sure to head on over and check it out. Thanks for the video tutorial – that made it much simpler to understand :) Just pinned this! I used half length strips of two different pinks to make two-toned roses ~ http://www.flickr.com/photos/tiffanyharvey/5737835886/ ~ Oh! And I made the wreath form with junk mail & tape – cheap & lightweight! Holy Moly I am in crazy love! Thank you so very much for the step by step video! I love these so much I had to share on FB! Thanks!!! Those are so cool! A great frugal decoration too! THANK YOU!!! I was really intimidated to make this (because they look so complex), but after seeing your video demo, I think I’m going to make these today! They are so pretty. Thank you so much for the video tutorial! I thought I understood how to make these before, but in reality – not so much. I’m going to go try again now! Thanks for the tutorial because I tried them last year and they came out ugly ;) I think I actually over twisted. So Pretty and a great tutorial! I hope you will link up this project to my I Heart Projects Party! Thanks Lindy for stopping by! I will try and stop over to link it up. Thank you so much for posting the video! Very helpful. I found a photo of this on Pinterest. I’m planning a bachelorette party/bridal shower at my house next month, and I’m definitely using your ideas. I got crepe paper in 2 shades of pink and rolled them together so the flowers are multicolored. They look great! Thanks so much for sharing that. I bet they turned out so pretty. I love the idea of two colors. Good Luck with your bridal shower. I bet it will be so much fun and the bride will really appreciate all your efforts. Hi, I was on pinterest and I came across the picture and then the video, Im thinking of doing this for my wedding, so i really appreciate the video, helps out a lot as im a visual learner and the video made it WAY easier to understand!! again, thanks so much!! These roses are awesome but I was always afraid to try them until I stumbled upon your tutorial. This is the best tutorial I have seen showing how to twist these roses. Thank you so much for sharing this information. What website do you recomend for buying big styrofoam balls for a low price? I’ve looked everywhere and they are just too expensive! These are amazing! but…how do you put the rosettes together to make the ball? LOVE this idea! Found it on my niece’s Pinterest site and repinned it! Your video is clear as a bell! THANK YOU!!! I’ve subscribed! Glad I found you! Ok.. I love these. I am actually inspired to implement these into my centerpieces for my May wedding. I’m pumped!!! You make it look so easy :) I ‘ve got my tissue paper and other materials ready. I’ll be sure to stop back by and show you my finished centerpiece!! One question though, how do you make the super big rosettes like in the first few pictures at the top of the page? Do I need more tissue paper?! Help! Thank you for sharing this! I didn’t know how easy this was to make & inexpensive. 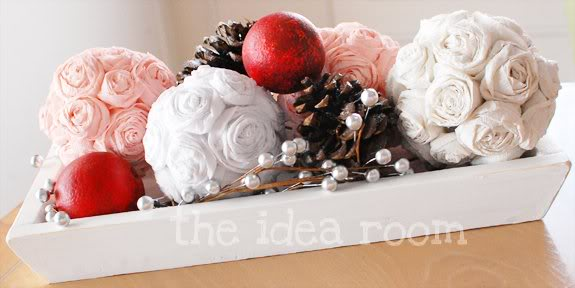 So excited to make these for my house & share with my craft club! I love this video on how to make the rosettes, but now I have searched for the big yellow and orange sunflowers that you showed you made at the beginning and you commented that they were a Martha Stewart kit…..I can’t find the kit now anywhere online. Can you tell me what kind of paper and size of the paper that was used for these? And how are they connected in the center? I think I can figure out the rest. Thanks!! What size ball did you use for those bouquets in the picture? How many rosettes would you need to cover that ball? I am planning decorations for a luncheon and need to know how much to buy. Glad you found the tutorial useful. I would love to see pictures when you finish your project.